HI FOR SALE THESE 2 WESTLIFE TICKETS FOR THE 3rd OF JUNE 2019 AT THE SSE HYDRO GLASGOW, SEATS 259 & 260 ROW Z. CANT MAKE DATE SO TRY GET MONEY BACK. Genuine, as used by the band. 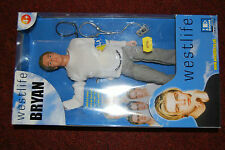 Westlife Bryan Doll. Item is in great Collection. For sale: An "as new" copy of the Westlife Official Magazine number 3, published in 2001. Carefully treasured but not read, hence condition as near mint as it could be. BLUE IN COLOUR WITH YELLOW EMBROIDERY. WESTLIFE Embroidered across the Chest and a W Embroidered of foot. Excellent Condition. Unused Ticket Stub(s) - Counterfoils/Stubs Attached/Intact. WESTLIFE LOGO ADJUSTABLE SILVER ON GREEN CORD BRACELET. NOTE : SILVER IN COLOUR, NOT STERLING SILVER. BEAUTIFUL GIFT, AS SOLD ON TOUR, NOW RARE & HARD TO FIND. IF YOU WANT IT, GO FOR IT! IF YOU'RE NOT SURE, DON'T! Westlife in a magazine from the UK January 2019. Will send just the Westlife article to save postage, good pics and worth reading for any fan. Condition is Like New. Dispatched with Royal Mail 2nd Class Large Letter. Happy to post worldwide. A4 120 piece Jigsaw of Pop Group. You can have the puzzle personalised if you like at top of picture as well as underneath. Puzzle is card backed and has a shiny surface. Heart shape Puzzles are also available. These mugs are extraordinary in clarity and have vibrant, beautiful colours. This will give it an excellent reproduction in both colour and sharpness. ceramic coffee mug. 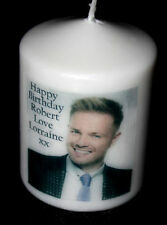 Each mug has a full individual photo either on front and back or wrap around. OFFICIAL PLATINUM TICKETS Block 118 Row K Seats 11-12 Only selling as now have a holiday booked! PVD Personal Video Disc For Use With VideoNow PVP Personal Video Player. Westlife - Flying Without Wings. Natasha Bedingfield - Single. VIDEO NOW PVD PERSONAL VIDEO DISC NEW & SEALED. O-Zone - Dragostea Din Tei. 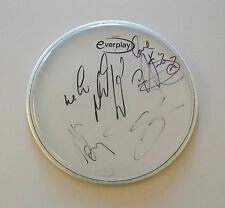 Signatures include Shane Filan, Kian Egan, Mark Feehily & Nicky Byrne. CERTIFICATE OF AUTHENTICITY (COA). Certificate Of Authenticity (COA). As is the nature of the Industry, autographs and signatures can vary ever so slightly - we may have more then one of a particular item, if so the item you will receive will be exactly as pictured, but the autograph maybe placed slightly differently. On the reverse they are individually printed with: PHOTO MARTIN SHAW (see photos). If I had to be super critical there is a very slight crease to the left hand middle edge (Kian Egan photograph) due to storage (see photos). BRIAN MCFADDEN. CERTIFICATE OF AUTHENTICITY, HOLOGRAM & UNIQUE SERIAL NUMBER . CERTIFICATES OF AUTHENTICATION (COA). ONLY 100% AUTHENTIC GENUINE PRODUCTS . EVERYTHING YOU SEE IS ACTUALLY HAND SIGNED BY THE PERSON(S) STATED ABOVE. 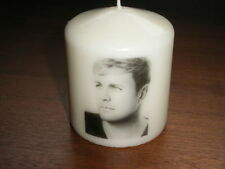 *NEW RARE* Westlife Bubblegum - Official Merchandise (2000). Condition is New. Official product. Very rare and hard to find. With 5 bubble gums inside. This piece of memorabilia is unopened and as new. It contains a press-on tattoo inside. Dates from approx. 2000, so over 18 yrs old! 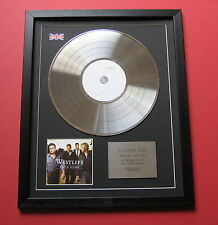 Westlife World Of Our Own Album UK Record Store Promo Poster. Measures approx 49cm X 70cm. Some light wear in places and has been folded. 9 CUTTINGS. VERY GOOD CONDITION.